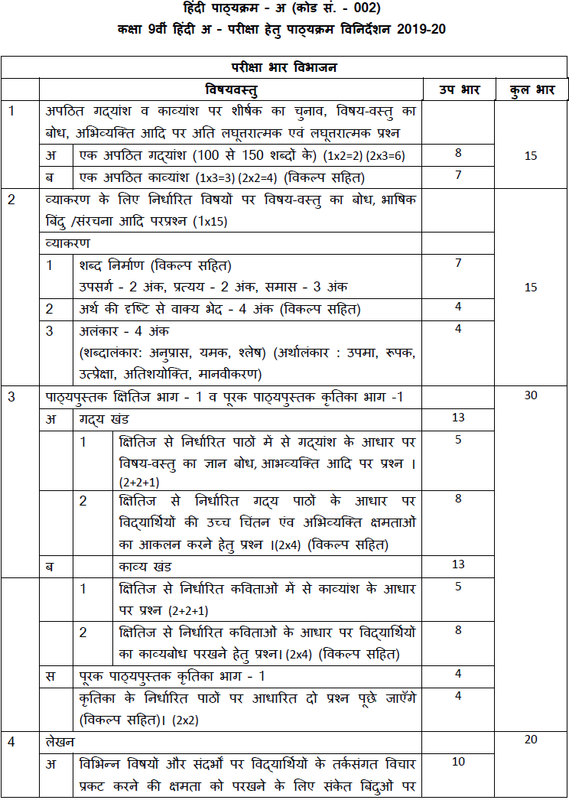 CBSE class 9 Hindi (Course A) syllabus for the new academic session 2019-20 can be downloaded with this article. CBSE syllabus for class 9 Hindi gives details of course structure and the question paper design for the annual examination. Here we are providing the complete syllabus for CBSE Class 9 Hindi Course-A. CBSE has provided the revised syllabus for the new academic session. Therefore, students are advised to go through the latest syllabus only as they start their course for the new session, 2019-2020. CBSE syllabus is a kind of instructive tool that conveys students a clear idea of the course content and the knowledge they will gain during the course. It explains the course structure and assignments, exams, review sessions, and other activities required for students to learn the material and excel in their academics. Students must carefully read the entire syllabus from the very beginning of the session, to get an idea of the course structure. Before starting a chapter or unit, list out all the topics prescribed in the syllabus for that unit so that you don’t waste time in learning the irrelevant or unnecessary topics. Having a clear understanding about your syllabus and the weightage of various helps to decide how much time you should dedicate to each section.